At Tillak we recognize that as a purveyor of outdoor goods, and as staunch advocates of good times spent outside, our health both as a brand and as individuals relies completely upon the health and accessibility of outdoor places. In an ongoing effort that we consider to be more of an unspoken responsibility than an act of gratuity, we have committed to giving back a minimum of 25% of our profits toward those people and organizations that fight day in and day out to protect, restore, and expand those special natural places that support not only our hobbies, but the wildlife and ecological processes that existed there far, far before we ever set up tents, pedaled our bikes, casted fly lines, or paddled out into the lineup. As devout fly anglers and passionate fish conservationists, much of us here at Tillak were well aware of the hard work being done by the Native Fish Society across much of the waters that span the Pacific Northwest. As a grassroots, science-based organization they constantly strive to protect and recover wild, native fish and promote the stewardship of their habitats. Through the implementation of their River Steward Program they have inspired and empowered a vast array of dedicated people to stand sentinel over their local watersheds and the fisheries that they support. So when we heard that one of their most recent River Steward-led campaigns was successful in deterring a group of proposed, highly toxic strip mines within a network of incredibly pristine and beautiful watersheds, we felt compelled to help them share their story. So please enjoy this short film that we co-directed and produced in partnership with The Native Fish Society and Zangs Films, we hope that it not only inspires you to become involved with this incredible organization, but to become a active steward of your own home waters or wild places. Over the last two decades, Native Fish Society has grown into the leading grassroots, science-based native fish conservation group in the Pacific Northwest. From their humble beginnings in 1995, Native Fish Society has gone from a small group of passionate anglers and advocates, to now serving over 3,000 members and supporters. Today, Native Fish Society has 90 place-based volunteer River Stewards who safeguard their homewaters and protect over 4,000 stream miles in Oregon, Washington, northern California and western Idaho. Their mission is to utilize the best-available science to protect and recover wild, native fish and promote the stewardship of their habitats. They achieve this important work through the empowerment, inspiration and growth of their cornerstone River Steward Program. Through these local voices, Native Fish Society is strategically equipped to ensure that science-based conservation is supported by local communities, drives real the on-the-ground changes and is codified in good policy. Together they’re working to gift future generations with the symbol of their region’s wild past and future vitality — wild salmon, steelhead and trout. Just seven miles upstream from River Steward Dave Lacey’s home in southern Oregon a foreign owned mining company was quietly working to develop a nickel strip mine on public lands. The mine would sit in the headwaters of two important wild salmon and steelhead streams. Learning about the poor environmental track record of the hard rock mining industry (the most toxic polluting industry in the United States) Dave and the Native Fish Society’s staff embarked on a three year campaign that ultimately sought to stop not one, but three proposed strip mines before they could irreversibly damage some of the wildest country, cleanest water, and healthiest wild salmon rivers on the west coast. Working with his local community, Dave canvassed his watershed going door to door with a petition against the mine, (later joined by River Stewards James Smith and Sunny Bourdon) they worked with the Native Fish Society to host events raising awareness about the mines in their rural communities, built local business and brewery coalitions to weigh in during public comment opportunities, gained the support of local city councils and their county commissioners, rallied hundreds of neighbors to turn out to pivotal public hearings, and flooded the public agencies and decision makers with over 64,000 supportive comments. Thanks to this immense and wide ranging support, Oregon Congressman Peter DeFazio and senators Ron Wyden and Jeff Merkley introduced legislation for permanent protections and secured the maximum protections the Department of the Interior can provide to discourage mining — a 20-year mineral withdrawal safeguarding 101,000 acres of public lands. Signed in 2017, this mineral withdrawal will not only help protect these public lands, it also protects the salmon studded rivers and communities found downstream. In southern Oregon and northern California Native Fish Society's River Stewards will continue to work with their communities to secure permanent protections from strip mining through federal legislation, like the recently introduced Southwestern Oregon Watershed and Salmon Protection Act. These River Stewards have also been working to secure protections for the clean water flowing through their streams; protections that will keep the rivers clean, full of water for fish and recreation, and prevent the mining companies from polluting these areas. Right now, River Stewards are working across the Pacific Northwest to protect their homewaters and native fish from habitat degradation, overfishing, harmful hatcheries and dams. We believe that the solution to these challenges facing the Pacific Northwest’s native fish can be found at the confluence of empowered and passionate local communities and the best-available science. Working together we can ensure that the Pacific Northwest continues to be defined by its iconic salmon, steelhead and native trout. To learn more check out all of Native Fish Society's current conservation campaigns at nativefishsociety.org/get-involved. 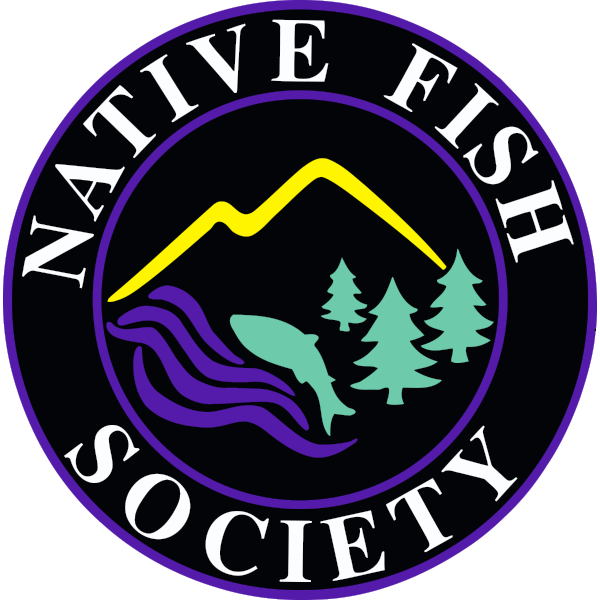 Join the Native Fish Society as a member. Every member receives their bi-annual print Strong Runs Newsletter, with stories of grassroots conservation from around the Northwest and their monthly e-newsletter Redd It that allows you to stay up on their work, take action on key campaigns and find out about special events happening around the region. If you live in the Pacific Northwest and want to safeguard your homewaters, contact Native Fish Society to learn more about the River Steward Program.